There have been at least five previous ‘global events’ in the geological record that mark the transition from one geological era to another and which resulted in the mass extinction of species. The Earth’s most severe event was the Permian-Triassic extinction event that occurred approximately 251 million years ago and about 90 % of all marine species and 70% of terrestrial vertebrate species became extinct. Many theories have been presented for the cause of the extinction such as the Earth being hit by an asteroid, a supernova producing lethal gamma radiation, or extreme volcanism. The Cretaceous-Tertiary extinction event, which occurred about 66 million years ago, is possibly better known as the dinosaurs disappeared, along with possibly 76% of all plant and animal species. It is widely accepted that the cause of the extinction was the earth being hit by an asteroid from space, an impact event, which landed in the Yucatan peninsula in south-east Mexico, which you can read more about here. Of the three main levels suggested – an ‘early Anthropocene’ level some thousands of years ago; the beginning of the Industrial Revolution at 1800 CE; and the ‘Great Acceleration’ of the mid-twentieth century – current evidence suggests that the last of these has the most pronounced and globally synchronous signal. 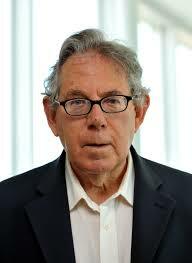 A boundary at this time … can be defined by a point in time of the human calendar. We propose an appropriate boundary level here to be the time of the world’s first nuclear bomb explosion, on July 16th 1945 at Alamogordo, New Mexico; additional bombs were detonated at the average rate of one every 9.6 days until 1988 with attendant worldwide fallout easily identifiable in the chemo-stratigraphic record. 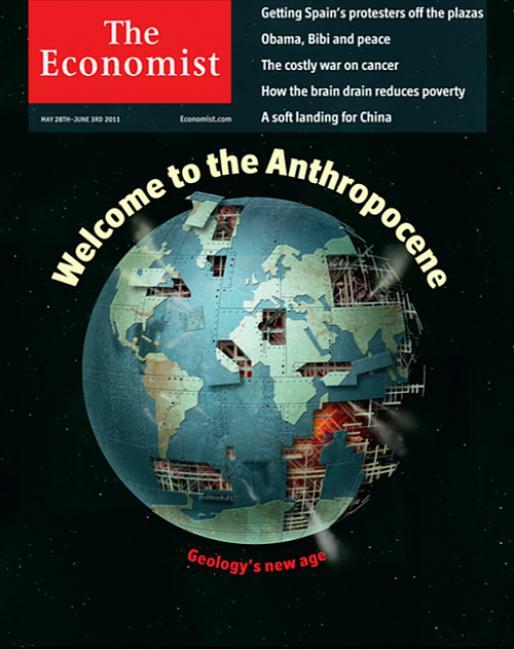 The Anthropocene however is not just a scientific term. It is something that is relevant to all of us. The consequences of the ‘great acceleration’ of human activity on the earth’s biodiversity and on its climate are very evident. Human activities have accelerated the rate of species extinction. Whilst the exact rate is controversial, it is possibly 100 to 1000 times the normal background rate of extinction. In just the oceans, a 2010 study published in Nature found that marine phyto-plankton – the vast range of tiny algae species accounting for roughly half of Earth’s total photosynthetic biomass – have declined substantially in the world’s oceans over the past century. Since 1950 alone, algal biomass decreased by around 40%, probably in response to ocean warming – and the decline has gathered pace in recent years. On land, wildlife populations have halved in the last 40 years according to a report by the World Wildlife Fund (WWF) and the London Zoological Society (ZSL) in September 2014. Wildlife and their habitats are destroyed by agriculture, logging, pollution, and by the damming and diverting of rivers. Animal numbers are decimated by humans killing them for food in unsustainable numbers, by hunting and shooting them for pleasure, and by the introduction of invasive species. According to a study by an international team of scientists Defaunation in the Anthropocene in the journal Science in July 2014, the current loss and decline of animal species, which is associated to human activity, is contributing to the early stages of a sixth mass biological extinction event. This includes a 45% decrease in the number of invertebrate animals such as beetles, butterflies, spiders, and worms in the past 35 years, during which time the human population has doubled. Human activity has led to an increase in atmospheric carbon dioxide. During the glacial–interglacial cycles of the past million years, natural processes have varied CO2 by approximately 100 parts per million (from 180 ppm to 280 ppm). By 2013, net emissions of CO2 produced by humans have increased atmospheric concentration of CO2 by a comparable amount from 280 ppm (Holocene or pre-industrial ‘equilibrium’) to approximately 397 ppm. This change is especially significant because it is occurring much faster, and to a much greater extent, than previous, similar changes. Most of this increase is due to the combustion of fossil fuels such as coal, oil, and gas, although smaller amounts are due to industrial production and land-use changes like deforestation. This will have led to more extreme weather, changes in patterns of rainfall, changing river levels, changes in the ocean currents, rising sea levels due to the melting of ice sheets and glaciers, and increased desertification. There are other irreversible and detrimental changes being made to the Earth by human activity from fossil fuel extraction, mining for minerals, huge infrastructure projects, heavy industry plants, for example. These are just the effects of human activity on the earth, not on the human race. The current and likely future consequences of human over-population and over-consumption for humans themselves are just as severe: food shortages due to too many people, water scarcity due to increasing use for irrigation and by heavy industry, soil degradation, water and land pollution due to overuse of fertilisers, conflicts over land, increased migration, land grabs, insufficient housing, dwindling mineral resources, and adverse effects on health from food derived from intensively reared animals or due to air pollution from transport. 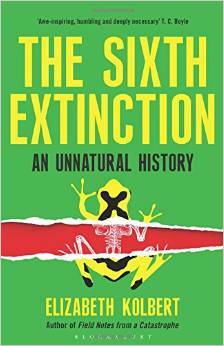 According to Elizabeth Kolbert in her new book The Sixth Extinction: An Unnatural History, the human species is now at the same point as when the 10 km (6 mi) asteroid that landed in the Yucatan Peninsula 66 million years ago, an event that wiped out not just the dinosaurs, but most plant and animal species. So it is not just other animals that are facing a sixth mass biological extinction event, we are too. Our effect on the Earth is not as spectacular or as instantaneous as an asteroid, but in geological terms it might as well be. Elizabeth Kolbert says that if all human civilisation were to end now, then in 100 million years time, everything that we had built, if spread evenly and compressed, would in the geological record amount to a layer of sediment ‘not much thicker than a cigarette paper’. For a species that has been around for less than 1% of 1% of the earth’s 4.5 billion-year history, Homo sapiens has certainly put its stamp on the place, and now we’ve even got a name for it. In a hundred thousand years, scientists will look at the environmental record and know that something remarkable happened in the second half of the second millennium. …. Historically the collision of the old and new worlds marks the beginning of the modern world.